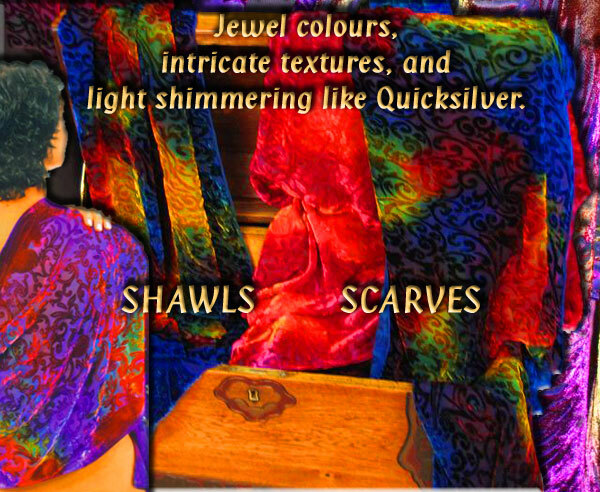 Devore Velvet Shawls and Scarves, hand painted wearable art. The base fabric is luxurious rayon pile woven into a sheer silk chiffon backing. Intricate designs are chemically etched into the rayon pile exposing the silk chiffon. An embossed or relief textured effect is created, with the remaining deep pile in striking contrast to the sheer chiffon pure silk base.